.... Luther rejected the saints’ days, believing they were built upon legends and superstitions (and a virulent strain of moralism we might add). In Germany, Luther replaced Saint Nicholas’ Day with a different holiday, Christ Child, or Christkindl. 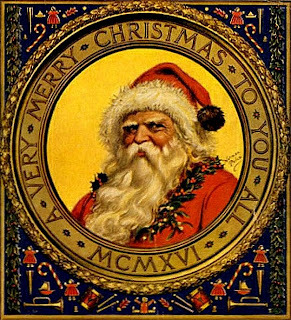 Ironically, Kriss Kringle which derived from Luther’s Christ Child holiday, has become just another name for St. Nicholas. At any rate, it is easy to see how Sinterklaas evolved in America to Santa Claus. Santa Claus became the Santa we know in the United States only after the poem “Twas the Night Before Christmas” was written in 1823. Possibly the best known verses ever written by an American, the poem has greatly influenced the tradition of Santa in the English speaking world and beyond.